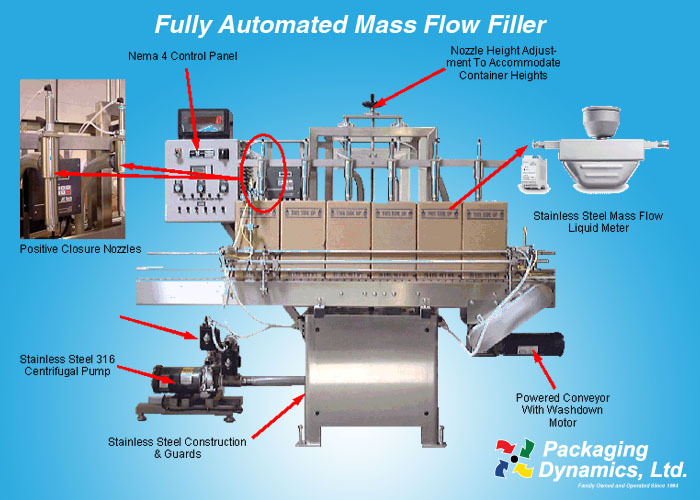 Fully Automated Mass Flow Filler - Packaging Dynamics, Ltd.
Packaging Dynamics Ltd. introduces the Mass Flow Liquid Filler which utilizes Emerson Micro Motion Coriolis flow meter mass technology. The Coriolis flow meters measure mass directly and therefore are insensitive to changes in process conditions or fluid composition. 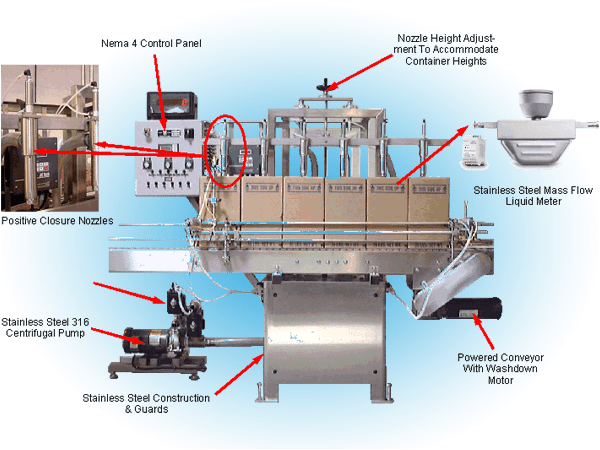 The systems meet performance requirements of manufacturers in the cosmetics, pharmaceutical, food and beverage industries. These requirements include accuracy of +/- 0. 5%. Product viscosities vary from water to 40,000 cP with particulates. The Coriolis Flow meters also allow measurement of density and temperature to check if products are within quality specifications. Changing over a piston filler means many hours of dismantling, cleaning and re-assembling before production can continue. The Flow Meters change over procedures are easy. The operator will simply run clean in place fluid (CIP) through the flow meters then set a new fill weight. This equipment is available from single to twelve head models and handles viscosities from water thin to gels and thick creams. Available in semi- and fully-automatic variations, the Mass Flow Meters can be used to fill from fractional containers to 55 gallon drums offline.